Acknowledged author Arthur E. Jongsma Jr. wrote The Complete Adult Psychotherapy Treatment Planner: Includes DSM-5 Updates comprising 608 pages back in 2014. Textbook and etextbook are published under ISBN 111806786X and 9781118067864. 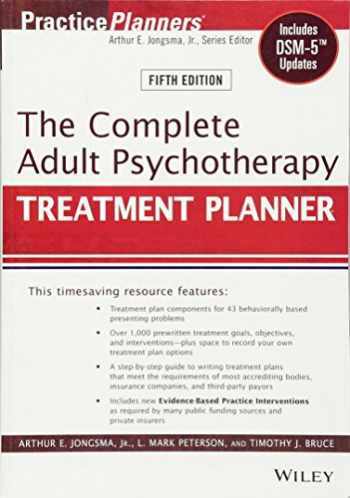 Since then The Complete Adult Psychotherapy Treatment Planner: Includes DSM-5 Updates textbook received total rating of 4 stars and was available to sell back to BooksRun online for the top buyback price of $13.40 or rent at the marketplace.